Welcome to another book review. 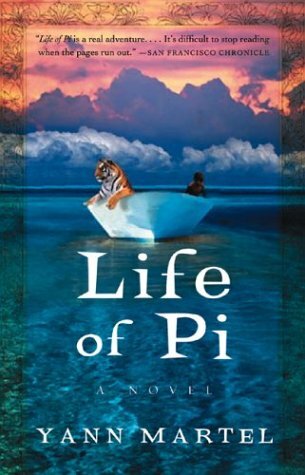 Today I would like to speak about a great novel I read entitled: Life of Pi by Yann Martel. The story in many ways has creation all over it. There are eferences to man, animals, God, sun, moon, stars, water, etc. I guess if you are going to write a novel, incorporating everything in heaven above and earth below is not a bad idea. Who in their right mind is bored by creation? When I read the book I wasn’t looking for a defense of biblical theism, I was looking for a story that confirmed the majesty of the God of Scriptures, as Psalm 8 tells us. Life of Pi did that. It was creative and remarkably written. If you wanted a tour of a zoo with the most descriptive terms, the beginning of the book provides that for you. In many ways, the author takes on the role of a zoo apologist. Pi grows up in the zoo and learns everything he needs to know about animals, and he also learns –which is important as the story develops—how to keep the animals controlled and content. The novel makes a fairly compelling case for the necessity of zoos. The standard argument that animals need to be free in the wild is addressed head-on and answered quite appropriately I think. Animals are free in any place where they know they can control. The two great dangers of the wild are foes and food. In the zoo, animals are protected from foe and food is provided abundantly. Religion and animals come back to the discussion in Part Two of the book with that great line: “The Ship sank.” The story of Pi’s survival in the sea for over 200 days is quite fascinating. You cannot help but be amazed at the wonderfulness of God’s creation and creatures. In order to survive, Pi has to abandon his vegetarian ways and eat whatever he can find…and the diversity is quite amazing from flying fish to turtles. Throughout the whole story we know that Pi will live through it, but at times you are left wondering if he really will make it through another day. Will Richard Parker, the tiger consume Pi in a moment of desperation? You have in this book man and an unlikely animal at sea seeking the same objective: to live. Life of Pi is a great journey through doubt, faith, and perseverance. I strongly recommend it. Until next time.